Once per turn: You can Special Summon 1 Fairy-Type monster from your hand. You must control a face-up Level 1 Fairy-Type monster to activate and to resolve this effect. You can activate the effect of .. Cannot be Special Summoned from the Deck or Graveyard. Once per turn: You can send 1 Fairy-Type monster from your Deck to the Graveyard. When this card you control is destroyed and sent to your Gravey..
Activate only when a Dragon-Type monster you control destroys an opponent's monster by battle. Tribute 2 monsters. Special Summon 1 Level 8 Dragon-Type monster from your Deck, and end the Battle Phase..
1 "Elemental HERO" monster + 1 WIND monster. Must be Fusion Summoned and cannot be Special Summoned by other ways. 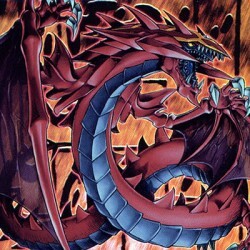 When this card is Fusion Summoned: Halve the ATK and DEF of all face-up monsters your.. Cannot be Normal Summoned or Set. Must be Special Summoned (from your hand) by sending 3 face-up Continuous Spell Cards you control to the Graveyard, and cannot be Special Summoned by other ways. When.. Choose an "Elemental HERO" Fusion Monster in your Extra Deck whose listed Fusion Material Monsters are banished, shuffle the banished Fusion Material Monsters into the Deck, then Special Summon that F.. Cannot be Normal Summoned or Set. Must be Special Summoned (from your hand) by Tributing 3 Fiend-Type monsters, and cannot be Special Summoned by other ways. Each time your opponent Normal Summons a m..
During the End Phase of the turn this card was Tribute Summoned by Tributing a Reptile-Type monster: Target 1 monster that was used for the Tribute Summon of this card; Special Summon it from the Grav.. Cannot be Normal Summoned or Set. Must be Special Summoned (from your hand) by sending 3 face-up Trap Cards you control to the Graveyard, and cannot be Special Summoned by other ways. This card gains ..